With the cold weather approaching, you might be considering options to make some of the colder rooms in your house more comfortable. With rising utility bills and a more severe climate, it may be a good idea to consider indoor propane heaters. They’re not only cheaper to run than electric heaters, but also, they can easily heat up a room fast. And in some cases are portable enough for camping or outdoor use as well. In this article, we’ll look at the different styles of an indoor propane heater, how to safely handle them, and suggest some top picks. Let’s get started! Indoor propane heaters come in two types: portable and permanent. 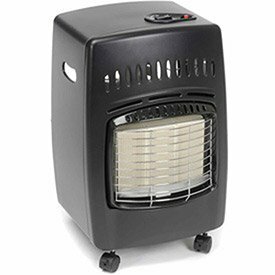 Portable heaters can be moved easily to wherever needed and are typically smaller in heating capability. They are normally used to supplement an existing heating system which may inefficiently warm space in the house. 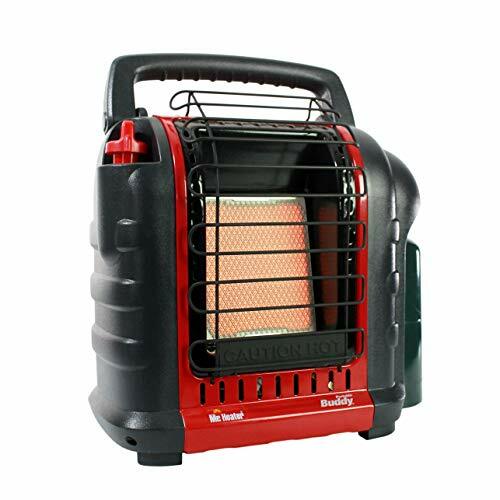 Portable indoor propane heaters are also great for providing heat while camping or during a power failure. Indoor portable heaters generally don’t have extra ventilation. On the other hand, a permanent indoor heater is usually mounted to a wall in the home and is attached to a larger tank of fuel that is located outside the home. The storage tanks are fixed in place and filled by a delivery truck. These permanent heaters are larger in heating capacity than a portable model. They are intended to heat a bigger room or an entire house. Most models employ a circulation fan inside the heater to distribute the warm air where needed. Because of their size, these heaters produce a larger volume of exhaust gas that must be vented outside the home for safety. Because of the danger of poisonous gases and other emissions, indoor heaters have several additional safety features. They are not typically found on outdoor models. Because of the need for these safety improvements, it is critical that you never use an outdoor propane heater indoors. Even for a short period of time. All indoor propane heaters will be certified for indoor use. While the safety features offered by each manufacturer will vary, some of them are common in all of them. All models of indoor heaters include tip protectors that extinguish the flame if the heater is knocked over. Another safety feature is the oxygen depletion sensor (ODS) that shuts off the heater when the oxygen in the room falls below a safe level. Overheat protection is a feature that will instantly turn off the burner and gas when the unit overheats. Or if the gas is flowing in while the burner is inactive. Another nifty innovation is one hand piezo ignition, which means you don’t have to bother with lighting up the pilot whenever you want to use the heater. These protections help to make them safer for indoor use. An indoor propane heater can be a good idea if you want to efficiently and cost-effectively heat up cold spaces in your home. However, with so many models out there, it can difficult to decide. Here’s our round-up of the top picks to help you out. Find the products below for review. This model is a 4000-9000 BTU radiant heater able to heat spaces up to 225 square feet. Amongst its numerous safety features, it shuts off if the pilot light goes out, if it tips over, or if it detects low oxygen. It has a fold-down handle for easy portability. Can be used both inside and outside. It is easy to carry around and simple to use. It is very fuel efficient making it quite cheap to run. Plenty of safety features to combat carbon monoxide poisoning and fire risk. It does not work well at altitudes of 7000 feet above sea level. The exposed flame makes it a little bit of a risk for children and pets. This is a remarkably effective and powerful heater. A versatile heating solution, it can be used both indoors and outdoors but isn’t suitable for higher altitudes. 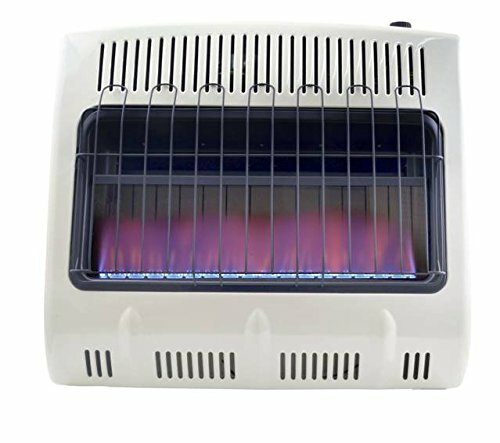 This radiant 4,000-18,000 BTU Liquid Propane heater connects directly to two 1 lb. cylinders and is the perfect solution for heating enclosed spaces like cabins up to 450 sq. ft. The integrated fan increases the heating capacity of this unit, using both radiant and convection style heat. The built-in Piezo sparking mechanism will take care of the rest. Our safety is ensured by the Oxygen Depletion Sensor (ODS) and accidental tip-over safety shut-off. Convenient lighting by pushing and rotating the knob. Low, medium and high heat level control knob for steady temperatures. Auto shut-off if tipped over, if the pilot light goes out, or if detects low oxygen levels. The heater may not work at altitudes over 7,000 feet above sea level. ​This is an extremely effective and powerful heater. It can be used both indoors and outdoors but isn’t suitable for higher altitudes. Unlike most indoor propane heaters, the Blue Flame heater warms the air using convection, not infrared. It can be put in a narrow area because the heat rises and warms the area from the ceiling down. It can be turned on automatically using the electronic ignition and can be wall mounted using the included hardware or stand on its own. Producing up to 30,000 BTU of heat, it can warm up to 750 square feet. Built-in ODS sensor will keep you safe. Produces plenty of heat, enough for 750 square feet. Can be wall mounted to keep it out of the way of pets and children. The heater may not work at altitudes over 4,500 feet above sea level. ​This heater uses convection rather than infrared to heat large areas. It is effective indoors but not outdoors, and won’t operate at altitudes over 4,500 feet above sea level. 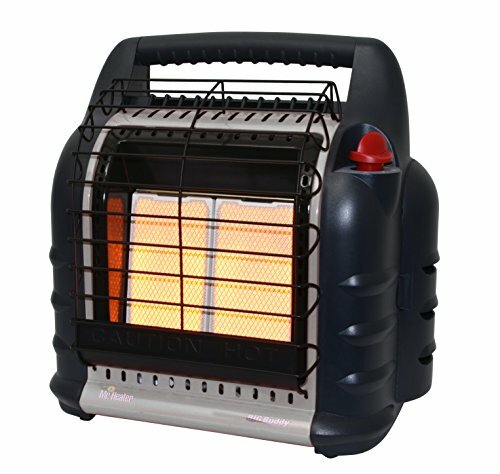 This portable little heater comes with side carry handles and locking casters for easy portability. It heats up to 600 feet radius, so it works well in large rooms. It can produce 18,000 BTUs of heat and has adjustable heat settings. For safety, it has built-in oxygen depletion shutoff (ODS) and is CSA Certified for Safety. It has a piezo igniter for convenient lighting and comes with a 1-year limited warranty. Easy to light with piezo lighter. Built-in safety features like ODS. Heats up a large area of up to 450 square feet. Tip switch is quite sensitive, so may create issues for some users. When first used, heater gives off a nasty smell, but this goes away after the first use. ​Both effective and energy efficient. 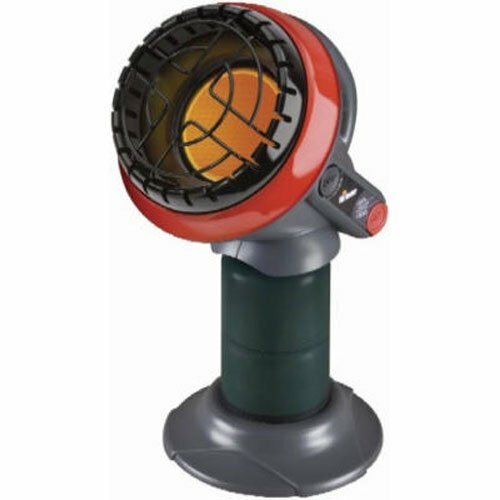 This little heater has plenty of safety features that will keep you safe during operation. Some users have complained that the tip switch is too sensitive, so keep that in mind. With a low-oxygen sensor, automatic tip-over, overheat shut-off, and a cool-to-touch exterior, this little heater is both safe and effective. It can heat rooms up to 95 square feet and has a simple on/off button. Very good heating for a small heater. It is lightweight, making it easily portable. Suitable for use both indoors and outside. The heating surface is coated in porcelain to spread the heat and distribute it evenly. There is no temperature control; it is either on or off. It is difficult to clean, which according to the company, is a common complaint. ​It is a great little heater for indoor or outdoor heat. It is surprisingly powerful for its small size, but the heat output isn’t adjustable. Ensure ventilation by cracking open a window. It may seem strange to open a window when you’re trying to heat up the place, but you have to avoid filling the room with poisonous gas. High levels of carbon monoxide can be fatal, and the early signs of poisoning are similar to flu symptoms: a headache, dizziness, and nausea. If you’re feeling these symptoms and suspect the heater isn’t working properly, get some fresh air right away. Check for gas leaks regularly. And every time you connect your heater to its fuel supply, check the connection points and hoses for damage and/or any potential gas leaks. If you smell gas, try applying soapy water to connections between hoses, the unit, and cylinder, and inspect for bubbling. Carefully listen for the hiss of gas escaping, and touch the cylinder to feel for extreme cold. If you suspect the connection or cylinder is leaking, do not light the heater—it will need to be replaced. When running the heater, keep it out of reach of pets and kids and well away from foot traffic. Place it away from flammable materials. And do not store extra LP or propane cylinders near the heater while it’s in use (fuel cylinders should always be stored outside). Also, make sure it’s not too close to your carbon monoxide detector for a more accurate reading. Propane heaters are both convenient and effective for heating up the colder spaces in your home. Whether it’s a project in your garage or you need to keep warm on a camping trip, a portable propane heater will come in handy for sure. Keep in mind that indoor propane heaters need to have essential safety features. To prevent gas leaks, carbon monoxide poisoning and overheating. Always ensure that the heater you purchase is rated for indoor use. In case you’ve decided to go for a propane gas heater, consider our top picks above for proven products that will give a great performance.